Even the most finicky cat would love this small food dish with his name on it. Engraved with a fish bone, this ceramic bowl will make meal time festive. 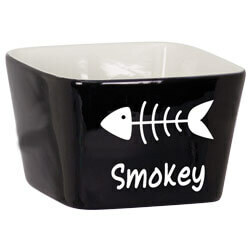 4" x 4" x 2 5/8"
Featuring a fish bone graphic, this customized food dish is purrfect for your fun feline. Choose from black, blue or red outside. Inside is glazed in white. Permanently engraved into the cermic in white. Order one for each of your pets today!